A couple of weeks ago, I got a surprise email from the individual who represents the series Atomic Betty, as well as the voice behind Betty, Tajja Isen. Needless to say, I was amazed and thrilled at the offer of doing an interview with Tajja. I watch the series every week, and have even watched most of the other shows she has done, including Berenstain Bears and Jojo's Circus. Just from reading up on her work history, it seems this young woman has been at it for some time, and has quite a large portfolio already. I know you'll enjoy this one, cause its not every day you can read all about such a talented youth actor, in the comfort of you own home! Where did you grow up? What sort of family environment do you have? Any siblings, pets, etc etc? I was born in Toronto, where I currently live. I am the oldest of four kids, and we are a very close family. I have two younger brothers (Joshua, aged ten and Koebe, six) and one younger sister (Nissae, aged eight.) Being the eldest is a fun challenge! Our family has three birds - an African Grey Parrot, a Cockatiel, and a Budgie - and one Beta fish. We spend lots of time together as a family, and as I've gotten older I have learned not to take our closeness for granted. How old were you when you got your first role? Interestingly, the first role that I earned was also my first voice audition. It was for the part of 'Sister Bear' on 'The Berenstain Bears', and I was ten years old. How do the kids at your school handle the fact that you voice some very popular animated characters? People at school think it's amazing, and some of them find it very surreal. I just started high school this year, and many of the students know about a lot of the shows that I do, and they even enjoy watching them! The theme song to 'Atomic Betty' (which I sing) is also a big hit at school - I discovered several people this year whom I didn't know previously who actually have the catchy tune on their iPods! You've worked on quite a few popular shows, including The Berenstain Bears, Jojo's Circus & your latest project, Atomic Betty. Of all the shows you have worked on, which is your favorite? I'd have to say that 'Atomic Betty' has been my favourite so far, since it is the first show that I've had the opportunity to work on that appeals to more of a pre-teen/teen audience as opposed to preschool. As well, I really love the fast-paced outer space action and great humour in the show, and the fact that I can relate to Betty makes her a fun character to voice. We are both sweet, smart and a little bit bossy (but in a positive way though!). It is always a great experience to work with people in all areas of productions, since so much work goes into any project and I spend lots of time working with everyone. With 'Atomic Betty' I have had the opportunity to work on two main areas of production - voice acting and singing. Being the voice, I had the pleasure of working alongside many great actors. It's always a lot of fun to become a character and assume their personality and then use it to play off another performer! As a musical artist, I had the pleasure of recording the newly released, 'Atomic Betty' CD with the experienced writers and producers, Kevin Gillis and Jack Lenz. We spent just over a year doing this and I had the most amazing time! I want to focus on a few shows now. First, The Berenstain Bears. Were you familiar with the characters, or even the old animated series, before you worked on this show? How did you get the job? What fond memories do you have from working on the series? Who were your favorite actors in the series? When I was younger, I had some of the old series on video, and I was also a huge fan of the books and had collected almost the entire series! It was an honour to be called in for the audition, where I was recorded reading select scenes from scripts. The creative team later made their choices based on these recordings. After a few callbacks, I scored the role as 'Sister Bear', and had one of the most wonderful experiences. My favourite actors to work with on the show were those who played Mama (Camilla Scott), Papa (Ben Campbell) and Brother Bear (Michael Cera), (my 'Bear Family') since I spent the most time with them in the studio. I have very fond memories of developing great relationships with all of them, it was definitely like we had a little family of our own during the recordings! You've also done another Very popular show, which is currently on Playhouse Disney - Jojo's Circus. What's your story behind this production? Working with the cast, anecdotes, and so on. What are your thoughts on the series? It was certainly exciting for me to work on the Disney cartoon 'Jojo's Circus', since I've been a Disney enthusiast since a very young age. I play Trina Trapezio, who loves ballet and is a little bit snooty. She's definitely the 'Little Miss Perfect' of the Circus Town bunch, and that makes her an interesting character to voice. When I record this show, all characters are recorded individually, with some of the cast being in New York and the rest in Toronto. They even used my voice as part of the Jojo's Disney Playhouse attractions in the Disney Theme parks which is pretty cool! I think that 'Jojo's Circus' is a very clever series for preschoolers because of how interactive it is. It doesn't just engage the audience during the show, but during the songs as well, and I think it's a great thing to get the kids up on their feet and dancing! A few other shows you've worked on include The Save-Ums, Franny's Feet and a Heidi feature. I've seen the Save-Ums, but haven't yet seen the other shows. Could you explain a little on what they are about? What did you enjoy about working on these shows? Any good stories, fond memories, etc? 'Heidi' is a feature length animated movie based on the classic story of 'Heidi,' written by Johanna Spyri. I play the sweet, innocent Heidi, who gets sent to live with her grumpy grandfather in Switzerland. In the movie, the role of my Grandfather was voiced by the amazing Christopher Plummer. I didn't get to meet or record with him since he recorded on patch, but one of the most exciting memories I have from Heidi is getting to silently sit in on his recording. I was honoured to be able to listen to such an acclaimed actor 'work his craft'! The other show,'Franny's Feet', is a series about a young girl named Franny, who helps her grandfather work in a shoe repair shop. Whenever a customer comes in with a new and exciting pair of shoes, Franny will step into them and be carried off on a new adventure. I sing the theme song to the show and have also voiced several guest characters. It truly is a thrill to voice such a popular character! When I first heard about the audition, I instantly fell in love with the character description since Betty is such a strong female persona, with a bit of a funny edge to her. As well, she seemed very easy to relate to, since she is so normal - even though she has the glorified job of 'Galactic Guardian and Defender of the Cosmos', she has absolutely no superpowers, she just relies on her smarts. So for the audition, I read an excerpt of the script for the producers and director, and after several callbacks, I earned the role! Recording the show is always a great experience, since the cast and crew are all friendly, and I have had the opportunity to work with many acclaimed (and hilarious) Canadian actors such as my 'ship crew' Rick Miller ('Sparky'), Bruce Hunter ('X-5') and Adrian Truss (Admiral DeGill). I know there are currently 2 seasons (104 - 11min episodes) so far. Are there any future plans for new seasons, or feature films? I have heard that there is work going towards a third season, and I really hope that it comes to be. Season two ends amazingly, and all I can say is it will definitely leave you wanting more. Even when I was recording the script, I was DYING to know what happens next! I can't give anything away though ... you'll just have to wait and see... The next thing that's going to be airing is an Atomic Betty Holiday Special called 'The No-L 9'. Saving the universe is crazy at the best of times, but when Betty is trying to save the universe during the holiday season - well, things get even more wacky! The special will be airing on Canadas' Teletoon on December 17th. I believe it has already premiered on Cartoon Network USA. Of course the talk of a feature film has come up and I really hope this comes to be!! Not only are you a voice actor, but also perfom on stage and live action tv shows. You were Nala in the Lion King stage production in Toronto for 11 months, and appeared on the series Doc and Judy & David's Boombox. First off, how did you score the role of Nala? What was it like, not only working in theater, but in one of the most popular stage productions of the last several years? When I first heard about the role of Young Nala I was nine years old, and my interest was sparked immediately. I had never done any professional theater, just some small local productions. However, I had always enjoyed it and was very excited at the prospect of having a role in such a massive musical. After my very first audition with Disney, I was told in disappointment that I was too small, although they would consider me as a 'future Young Nala'. 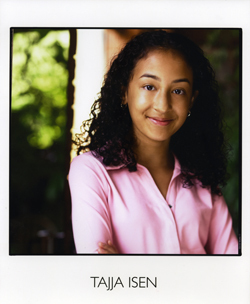 A year or so later, when the next casting call rolled around, I reauditioned, and after three or four callbacks, I received a phone call - "You're the next Young Nala!" Working on the 'Lion King' was one of the best experiences. I stayed in the role for eleven months, and I really learned a great deal from my fellow adult performers, being one of only four kids in the entire production. Eventually, everybody working in the show became like a second family, and the crazy network of backstage passages became like a second home! Being on stage is an experience I can't wait to reprise. Which do you prefer: stage, screen or voice? Why? They are hard to compare, since they are so different. I love being on stage because of the energy rush - you've only got one chance, you're performing and singing in front of a live audience, and of course it's always fun to get all dressed up in costume! The 'one chance' can sometimes present itself as a challenge though, since absolutely anything can happen and there's no fixing mistakes, you've just got to roll with it. On screen is more forgiving, since you have the opportunity for endless takes, and if you make a mistake in one scene, it is easy to redo. However, this performance style can become somewhat repetitive. Voice is enjoyable because it is very relaxed. There is always an opportunity for another take, but you don't have to think about makeup, costumes, blocking and other things associated with stage and screen. Overall, I'd have to say that stage musicals and voice are my favourite, since I love the thrill of stage but also the low-key vibe of the voice recordings. So how does your family like your immense success? My family is extremely supportive of my accomplishments, and very excited at the same time. We are a close family, and my parents and siblings are my main sources of encouragement. It is especially enjoyable for my young siblings to be able to tell their friends, "My sister is Atomic Betty!" As well, the publicity side of 'Betty' has given me the opportunity to travel to different places such as London England, Atlanta and Los Angeles - members of my family always come with, which they love! What are your upcoming projects? Any new stage or series coming up? As mentioned, the 'Atomic Betty' CD just released in November under the KOCH label. It really has a wide appeal to all ages and genres consisting of 10 songs with an eclectic flavour of rock/pop and R & B which we recorded over a one year period. We recently finished a second live music video for one of the songs on the album - 'Alien Ball (Do The Betty! )', and recorded 'A Day in The Life of Tajja Isen', both of which will be released shortly by Warner Bro's. In addition, I am currently voicing several lead characters for cartoons some of which are still in production. One of these include the Nelvana/WETA 3-D animated series called 'Jane and the Dragon.' The series tells the wild adventures of Jane, the feisty young girl training to become a knight (that's me!) and her best friend, a giant, talking, fire-breathing Dragon. The most exciting thing about working on the show is that I got to put on a British accent! 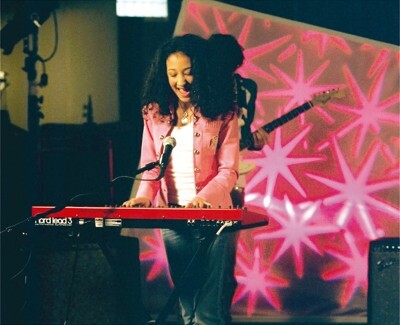 'Jane and the Dragon' will be premiering on YTV (Canada) in early January 2006. Other current work, include 'Time Warp Trio' (Jodie), 'MP4ORCE' (Kayce Kulp), 'Meteor The Monster Truck' (Ponytail) and 'Miss Spider Sunny Patch Friends' (Lil Sis). When you graduate high school, do you have plans to go to college? What would you like to do when you grow up? When I graduate high school, I plan to attend university and possibly major in Drama, Music or English, although I don't know which school. Acting , singing and writing music in general are definitely things that I aspire to pursue for the rest of my life, but there are so many other things that I also enjoy doing. I love to write, so maybe I'd like to pursue a career as a novelist or journalist.... there's just so much out there! Do you have any advise for future or current youngsters who want to be in cartoons, or on tv and stage? My advice to anyone who would like to get into entertainment is to immerse yourself in the character. So many people can show up at an audition and recite the lines flawlessly, but what is even more impressive is if you completely become the character (mannerisms, voice, etc.) It helps to practice reading scripts, maybe from your favourite movies or television shows, so you can get used to adapting different personalities. Even if you're just emulating your favourite cartoon hero for fun, it's excellent practice for when you are rehearsing for an audition. As well, you should always keep an open mind and remember that 'everything happens for a reason'. If you don't score a certain role or ace a specific audition, don't sweat it - you're not going to get every role you go out for. Enjoy every moment of it, because that's the most important thing - you're doing what you love. Now for the really easy stuff! What is your favorite color? Favorite food? Do you like video games, sports, stuff like that? Are you a shopaholic? Boy crazy? Favorite shows and movies? Who is your idol? And finally, favorite subjects in school? My favourite colour is purple, and my favourite foods are spaghetti and sushi. I'm more into computer games than video games - I love to play 'The Sims!' I enjoy sports such as swimming, soccer and badminton, although I don't do any of them competitively. As for the word shopaholic .... well, that's me in a nutshell! I love to shop - sometimes too much! I am also boy crazy, but then again, aren't all fourteen year old girls? I'm not a big TV watcher, so I don't think I have a favourite show ... with the exception of 'Atomic Betty', of course! My all-time favourite movie is 'Pretty Woman', which I've seen four times. I actually have two idols: The first is Alicia Keys because of her ability to write, sing and play the piano extraordinarily well, I think that makes her such a versatile performer. I play piano as well, and I am very inspired by her style. The other artist whom I look up to is Kelly Clarkson. Her performances are always energy-charged, and you can tell that singing for audiences is what she really loves to do! And finally, my favourite subjects in school are Drama, Science and English. See, I told you she was great! So well spoken and articulate. Its good to see someone who hasnt been corrupted from fame and fortune, as most people are in Tajja's shoes. And she even mentioned new shows she is working on, so we can all keep a look out for them, and be sure to pick her out of the crowd when the show finally airs. I have no doubt she will go far, since her talent already has no limits to its potential. Im looking forward to her future projects, and wish her all the luck!